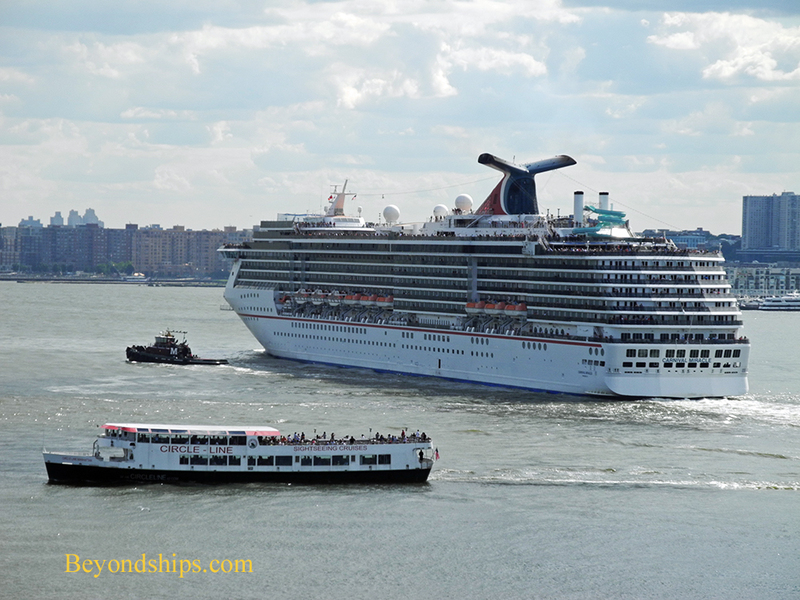 Above: Carnival Miracle passes a Circle Line tour boat on a cruise from New York. 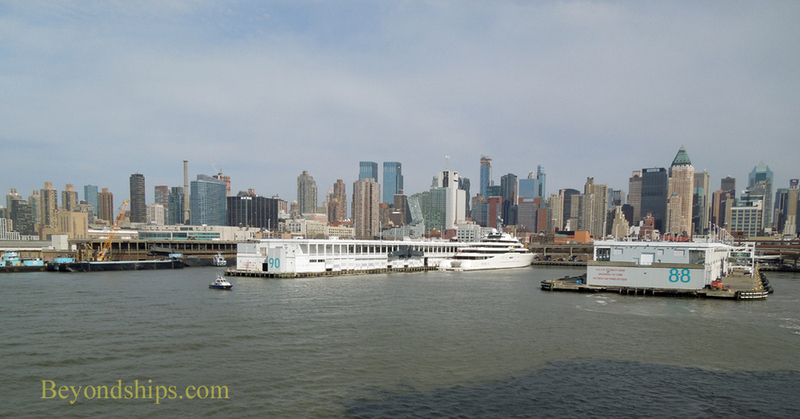 A not-to-be-missed experience in any cruise from New York City is sailing out of New York harbor. While the sail away from any port can be exciting, sailing from New York involves passing by world famous landmarks and the awesome beauty of the city's majestic skyline. Cruise ships usually leave in late afternoon when the city is still pulsating with life. The sun is starting to set over New Jersey illuminating Manhattan in a strong and colorful light. Ships sailing from the piers in Midtown Manhattan receive the full experience as they sail past more of the city on their way out to sea. 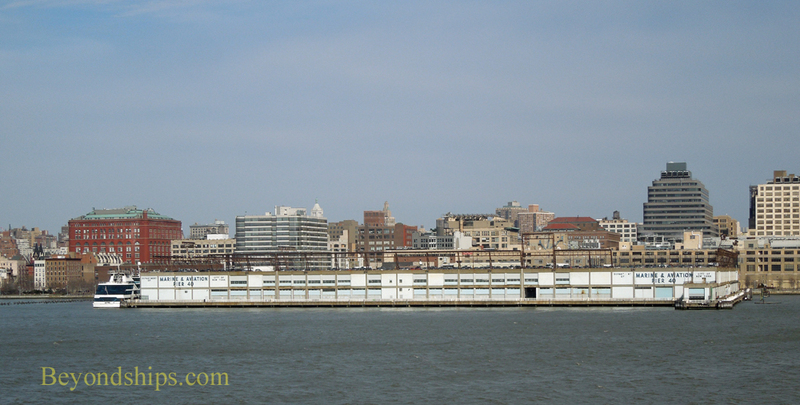 However, much can be seen on ships leaving from the Brooklyn terminal and the Bayonne terminal as well. Sailing into New York is a grand experience as well. You see the same sights, just in reverse order. However, the ships typically enter the harbor near dawn when the city is just coming to life. The sun is in a different position and the man-made towers and canyons are still in shadow. Still, it has its own quiet beauty. In this pictorial, however, we are focusing on the sail away. The sights are presented in the order that you see them sailing from the Manhattan piers. 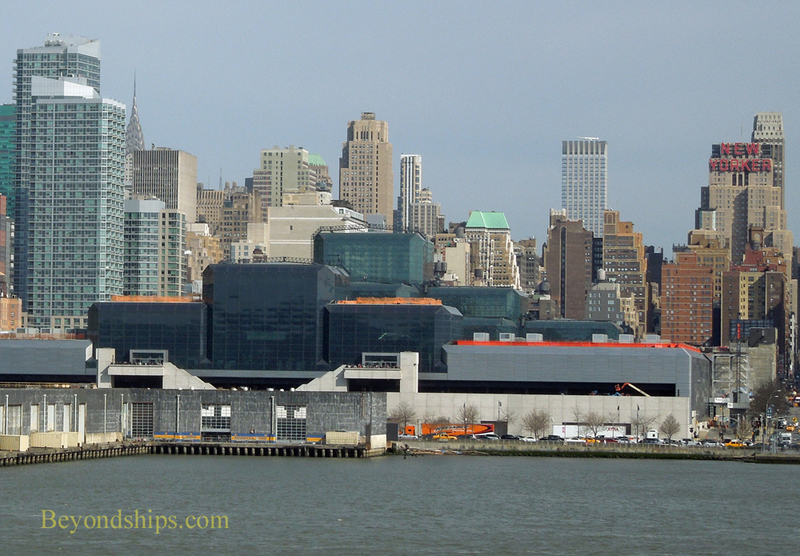 The journey begins at the New York Passenger Ship Terminal (also known as the Manhattan Cruise Terminal). It consists of three finger piers that stick out at a right angle to the shore into the Hudson River (called the North River here) . They are Piers 88, 90 and 92. There is much history here. These piers were first constructed in 1935 in order to accommodate the new 1,000 foot long liners Normandie and Queen Mary. However, they were also used by other famous ships during the Golden Age of ocean liner travel. During this period the area was often referred to as Luxury Liner Row. In 1942, the Normandie burnt and capsized in the slip between Piers 88 and 90 while being converted to a troopship. Normandie lay there for several years as Navy salvage teams labored to re-float her (see article). After World War II, the piers resumed their role as home to the world's luxury liners and hosted, among others, the original Queen Elizabeth, the France and, for many years, the legendary Queen Elizabeth 2 (QE2). 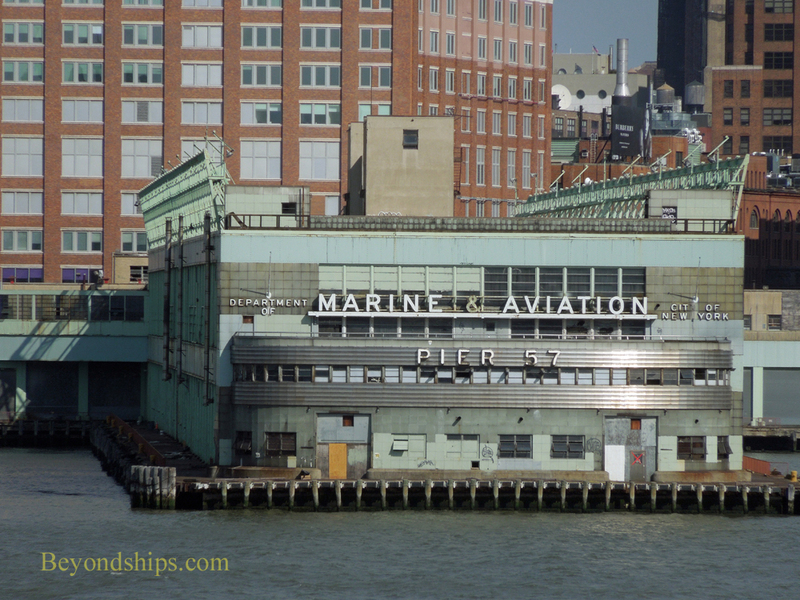 By 1970, the three piers had become antiquated and were extensively renovated, giving them an entirely different look. To bring the terminal up-to-date for modern cruise ships, the City commenced a new $200 million renovation project in 2004, focusing primarily on Pier 88. Pier 90 also received some upgrades and a new coat of paint. These piers can be challenging for mariners. Ships leaving the piers must back out so that the river's strong current is pushing against their starboard side. This has caused some ships to proceed downriver sideways. In order to avoid this and the possibility of having the bow collide against a pier, it is not unusual even for ships that normally do not require tugboat assistance to have one standing by when entering or exiting these piers. The Passenger Ship Terminal is an exciting place to begin a cruise. It is right there in the midst of Midtown Manhattan and shares its fast pace. Then there is the nostalgia from its glamorous past. Finally, the terminal offers a unparalleled panoramic view of the towers of Midtown. It is therefore not surprising that ships just entering service and wishing tp garner attention, usually dock here rather than at one of the harbor's other terminals. 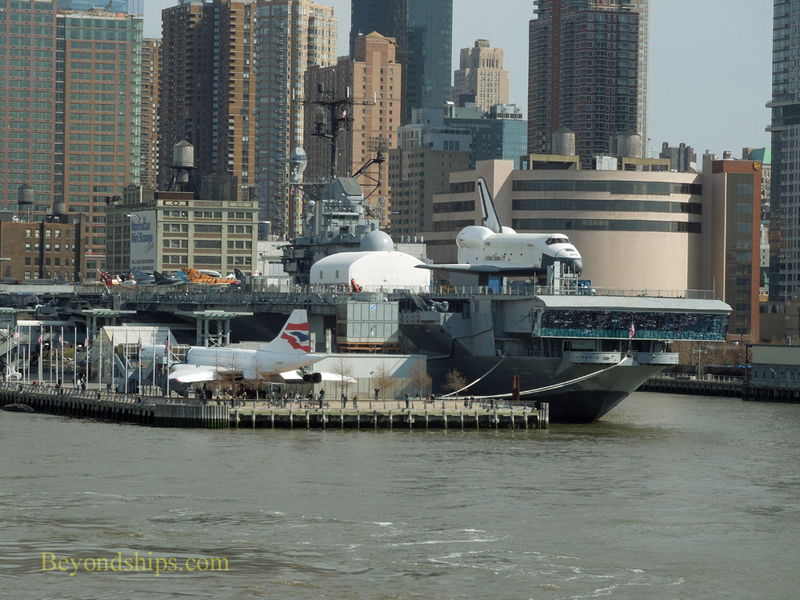 Next to the Passenger Ship Terminal at Pier 86 is the Intrepid Sea Air and Space Museum. U.S.S. Intrepid (CV 11) served in the United States Navy from World War II through the Vietnam War. She also was involved in the recovery of astronauts and space capsules in the early days of the U.S. space program. Today, the carrier serves as the platform for a museum focusing not just on the ship's impressive history but on aviation and space travel. 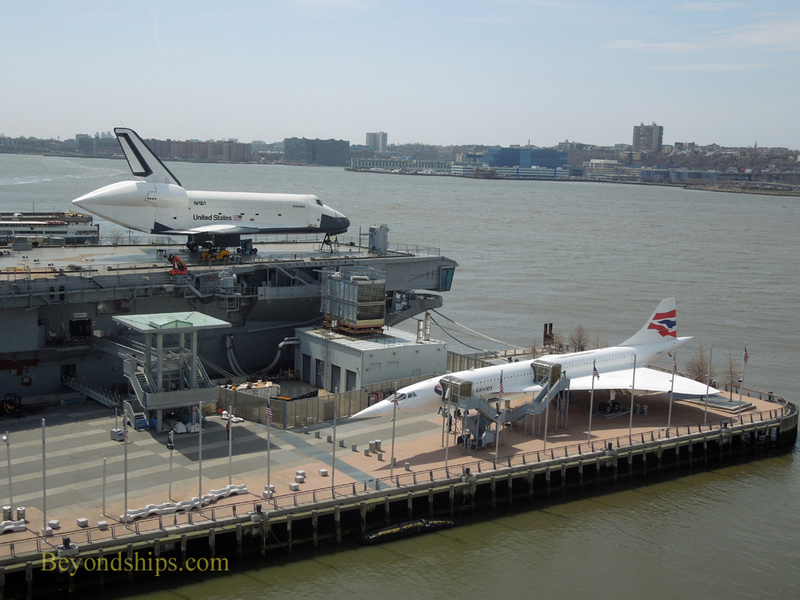 Left: Recent additions to Intrepid's collection include a Concorde and the space shuttle Enterprise. Shortly after your ship turns to starboard to go down the river, you pass 42nd Street, famed in movies and musicals (left). 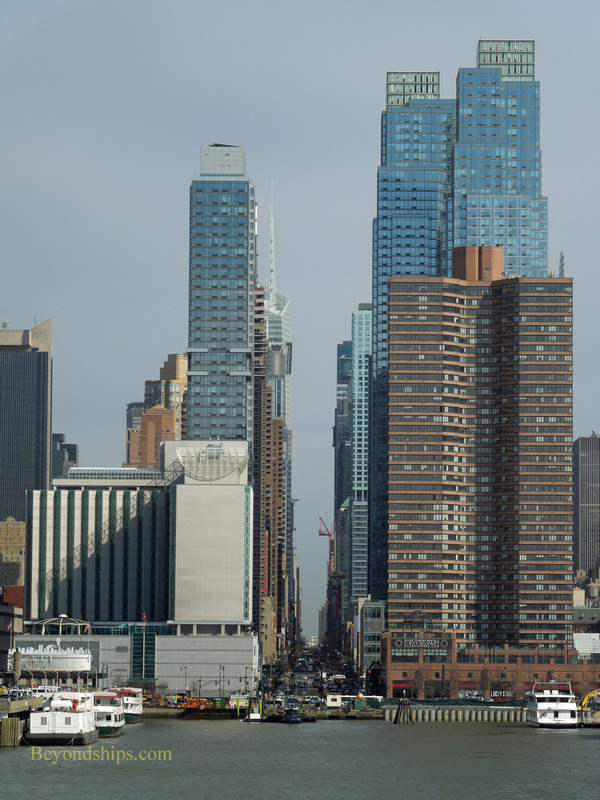 It traverses Manhattan from one side to the other unobstructed and is one of the busiest streets in the City. A few minutes later, you pass the Javitts Convention Center. At one time, there were piers all along the river. Many are now gone but others have been put to new uses. 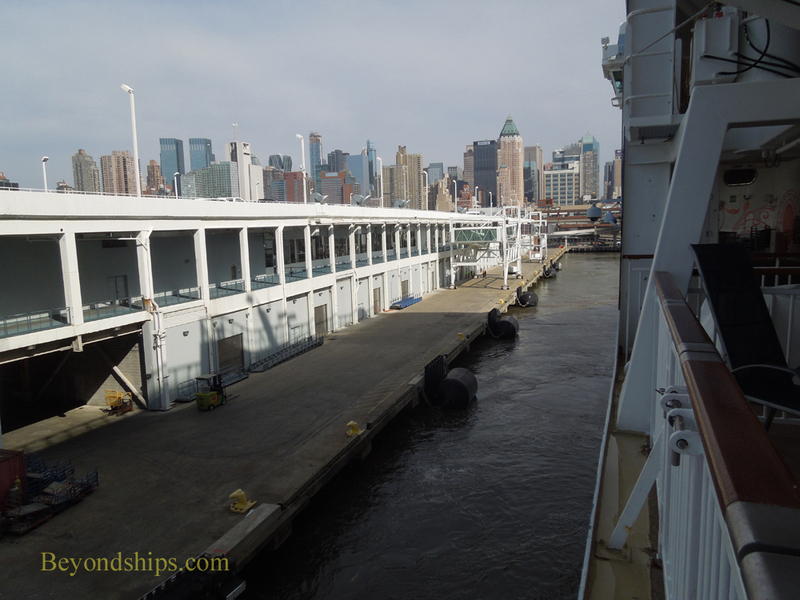 Still others such as Pier 54 (above), where the Carpathia docked with the survivors from the Titanic disaster and where the Lusitania embarked from on her final voyage, await a better future. 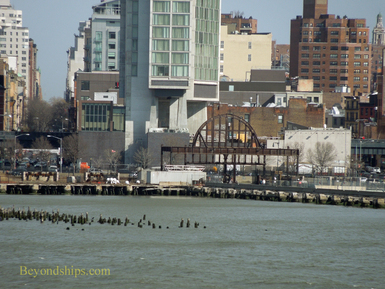 The most successful transformation of New York piers is the Chelsea Piers complex. These piers were Titanic's destination on her ill-fated voyage. 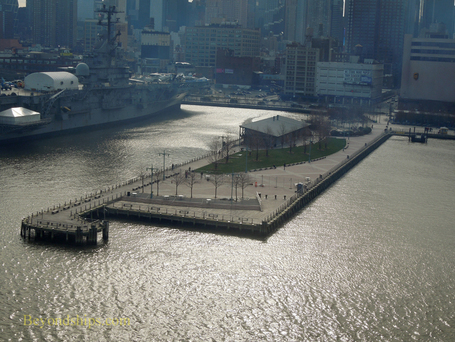 Today, iIn addition to providing berths for tour boats, these piers are an entertainment, sports and dining complex. It also houses movie and television production facilities. Although dwarfed by the Empire State Building, there are other skyscrapers in Lower Midtown Manhattan. One is the Metropolitan Life Building (left), which was inspired by the Campanile in St. Mark's Square in Venice, Italy. It was completed in 1909 and was the tallest building in the world for three years. 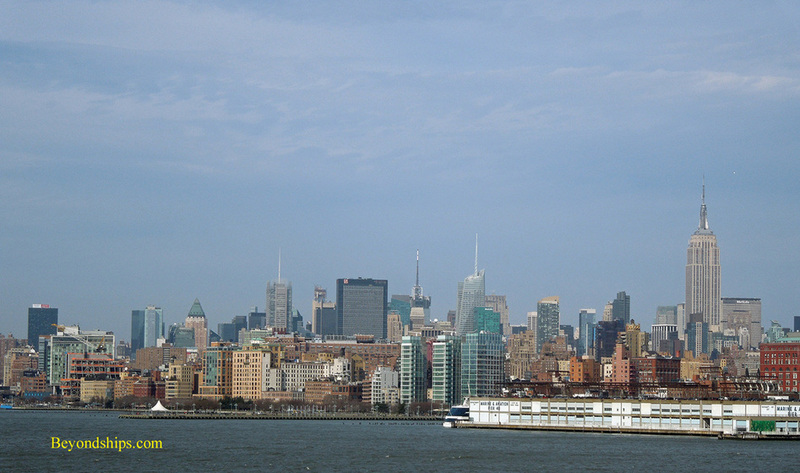 Below: The skyline of Midtown Manhattan. 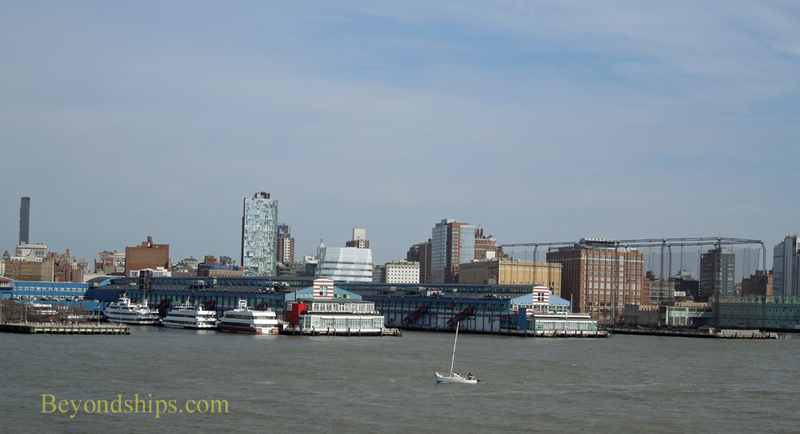 As you sail down the river, the most prominent landmark is undoubtedly the Empire State Building. The Art Deco 102-story structure was built in just 15 months, ahead of schedule and under budget. 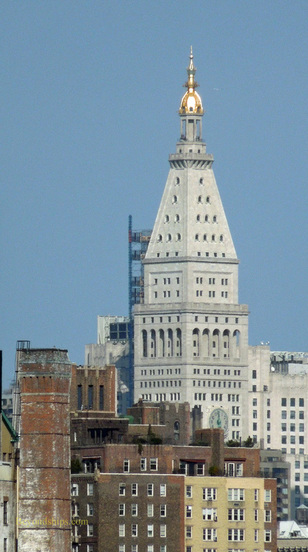 It opened in 1931 and remained the tallest building in the world for 40 years. The spire at the building's apex is a television antenna. It sits upon a structure that was originally planned as a terminal for dirigibles. However, the idea proved impractical due to high winds and updrafts at that level of the building. 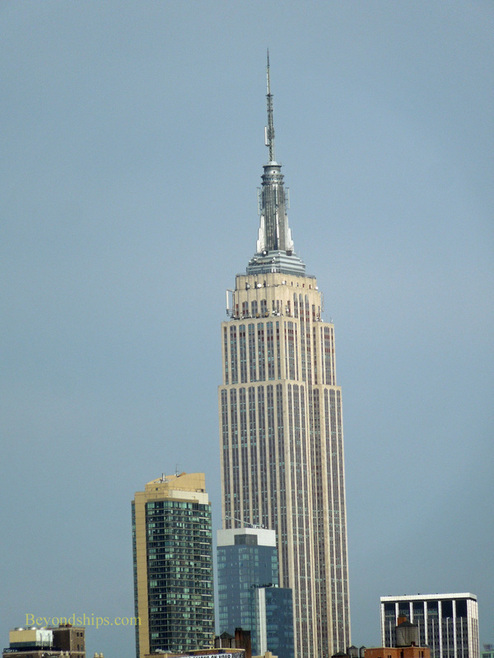 A cultural icon, the Empire State Building has featured in several motion pictures.